The new Retina MacBook Pro is an incredible piece of hardware. On its spec sheets, Apple claims it can support "up to two external displays", but it turns out that's bull. 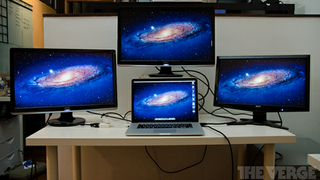 In fact, it can support three external monitors. Retina on laptop @ "best for Retina"
"Moving images and media didn't create any lag and we were able to play video on all four displays simultaneously." Four videos, simultaneously, with no lag. On a laptop. That's pretty sweet. For the record, Apple officially claims the MacBook "simultaneously supports full native resolution on the built-in display and up to 2560 by 1600 pixels on up to two external displays." But we know better.